Gold Coast District, Cultural Liaison Unit, Surfers Paradise Police, Fair Trade Queensland and Queensland State Tenant Advise have teamed up to host Coffee with a Cop in a bid to increase community engagement in Surfers Paradise. The event is open to all International Students, and invites Japanese students to share a coffee with a Japanese speaking Police Officer and Police Liaison Officer to discuss issues, ask questions or get to know a little more about their local community. 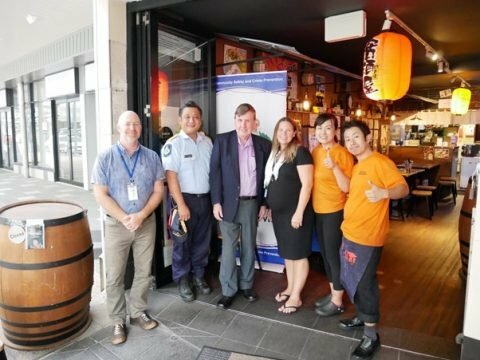 Surfers Paradise Police Officer Constable Tara Frohlich, who attends Coffee with a Cop events regularly, said it’s a great opportunity to positively engage with the local Japanese community and brush up on my Japanese language. “Building a positive relationship with the International Student community is crucial in preventing crime and keeping the community safe,” Constable Frohlich said. Police Liaison Officer Nao Hirano started this project in February 2019 and has had over 25 attendees. Apart from police providing general crime prevention and personal safety advise the following questions were answered relating to tenancy disputes, bond issues, working conditions, workplace harassment and immigration issues, which were referred to counterparts for solutions. If you want a Coffee with a Cop, the timings are the first Thursday of each month until June 2019 at Izakaya Umakamon Restaurant Shop 7/3063 Surfers Paradise Boulevard, Surfers Paradise between 3pm-5pm.